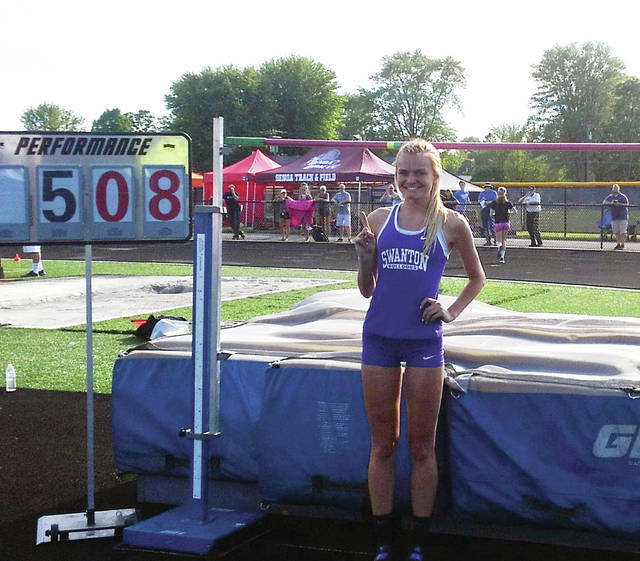 Swanton’s Julia Smith cleared 5-8 in the high jump to win the regional title and break the regional record on Wednesday. TIFFIN – The Swanton and Archbold girls track and field teams were in the top four of the team standings after day one of competition at the Tiffin Regional Wednesday. The Bulldogs led with 18 points, then came Leipsic and Liberty-Benton with 14, and Archbold was fourth with 10.5. Pettisville was tied for seventh at 6 points. The Delta boys were tied for 10th with Edon at 8 points. Colonel Crawford led the boys meet after day one. For the Bulldog girls, Julia Smith broke the regional record when she cleared 5-8 in the high jump to win the title. The senior beat out defending state champion Emma Daugherty of Maumee Valley Country Day School, who cleared 5-6. Shylo Richardson of Archbold tied for eighth (5-0) while Ella Ford of Delta tied for 10th (4-10). Swanton senior Sidney Taylor placed second in the shot put with a toss of 39-4. Grace Rigel of Leipsic won with 41-7. Two area 4×800 meter relay teams qualified for state. The Archbold team of Kylie Sauder, Brittney Ramirez, Gwynne Riley and Dakota Stamm won with a time of 9:34.16. Pettisville’s team consisting of Elizabeth Sauder, Nichole Foor, Kate Stuber and Morgan Leppelmeier took third with a time of 9:36.95. On the boys side, Hunter Tresnan-Reighard of Delta was runner-up in the discus with a throw of 155-11 to advance. Zach Morrison of Pettisville finished in a four-way tie for ninth in the pole vault, clearing 12-0. 4×800- 1. Liberty Center (Kundo, Keller, Stark, Meller) 8:08.03, 2. Colonel Crawford, 3. Ashland Crestview, 4. Toledo Christian. Discus- 1. Arbaugh (Van Buren) 163-11, 2. Tresnan-Reighard (Delta), 3. Volz (Sandusky SMCC), 4. Hedrick (St. Paul). Long jump- 1. Frias (Margaretta) 22-4.25, 2. Reed (Edon), 3. Poling (Liberty-Benton), 4. Cummings (Ottawa Hills). Vault- 1. Reinhard (Elmwood) 14-0, 2. Allen (New London), 3. Kotey (Liberty-Benton), 4. Sotak (Woodmore). 4×800- 1. Archbold (Sauder, Ramirez, Riley, Stamm) 9:34.16, 2. Liberty-Benton, 3. Pettisville, 4. St. Paul. High jump- 1. Smith (Swanton) 5-8, 2. Daugherty (Maumee Valley Country Day), 3. Bishop (Liberty-Benton), 4. Carey (Upper Scioto Valley). Shot- 1. Rigel (Leipsic) 41-7, 2. Taylor (Swanton), 3. Bryer (Genoa), 4. Brooker (North Baltimore). https://www.fcnews.org/wp-content/uploads/sites/45/2018/05/web1_Julia-Smith-High-Jump.jpgSwanton’s Julia Smith cleared 5-8 in the high jump to win the regional title and break the regional record on Wednesday.